45: Blink And You Missed It! 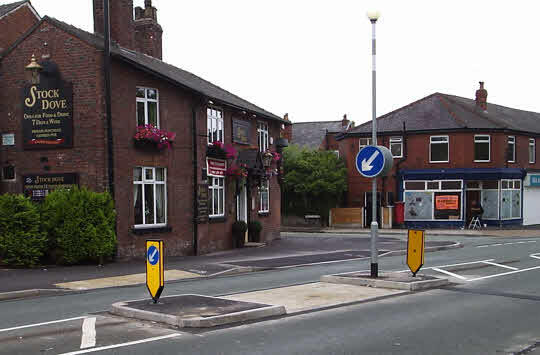 Forensic examination of the wreckage revealed that some careless driver had ploughed across the island from the west, flattening the lamp post and taking out the yellow sign with the arrow. 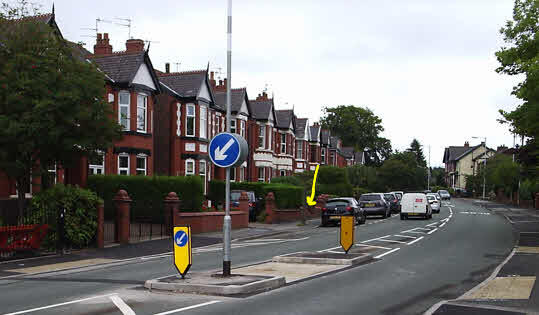 The triangle of red barriers surrounded the sawn-off stump of the crushed lamp post. The next picture shows where the driver stopped. 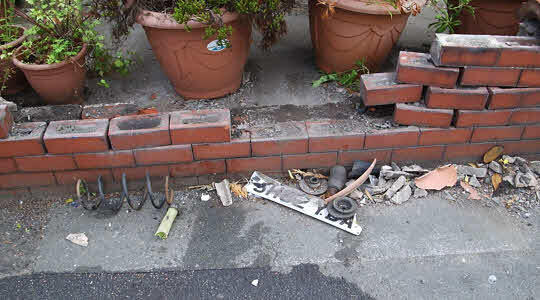 The bricks had been cleared away by the time your photographer arrived and the planters look surprisingly undamaged. Three days after being wiped out, the island was back in good order. Which is more than can be said for the destroyed wall (position shown by yellow arrow). Two weeks on, the island was reduced to rubble again. 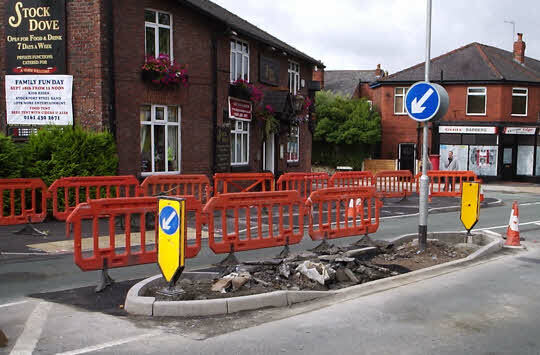 As the signs are intact, and it is full of official barriers, it looks like the contractors made a bog of things the first time around, and they have been told to knock it all down, dig up the kerb stones and start all over again. 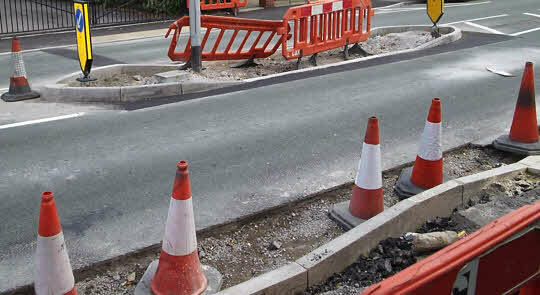 No wonder the council tax is so bloody high if Stockport Council's project oversight is so slack before the event. For the benefit of those interested in the history of trading in Romiley, our branch of Threshers went extinct along with the company but the building once occupied by the wine merchant has been brought back to life as a convenience store offering food, fags, booze and newspapers. Worse, the workmen are now digging up the just-installed kerb stones and knobble tiles in front of the Stock Dove so that they can trim about a foot off the pavement to give buses and other large vehicles extra room. 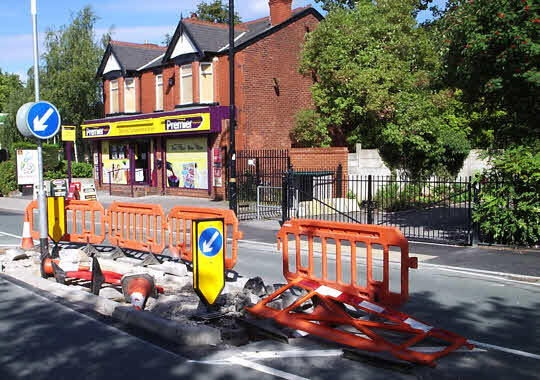 If it cost £250,000 to demolish the park area beside Romiley Forum and reconstruct it as an imagination-free zone, it must be costing about the same to mess about with the island. Numerous people are now asking why they didn't just put a pedestrian crossing here and avoid all this expense and messing about. The dark area of tarmac on this side of the island shows how much was made to go away when it was rebuilt smaller. 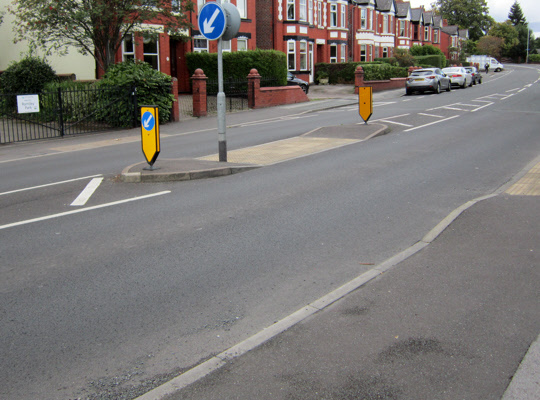 Similarly, the edge of the pavement has moved south by over the width of the base of a traffic cone at this point. They were working here on a Saturday morning in the rain, then the gang disappeared the following week when it was dry. 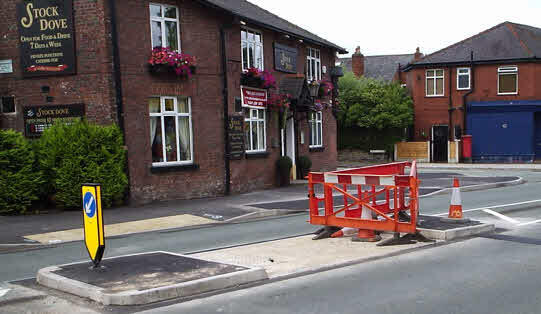 But they've finally got the re-shaped island surfaced, and the relaid kerb stones and knobble tiles tarmacked in. Meanwhile, the barber shop in the background (on the right of the pictures) has gone from shop-fitting to open for business. 50a: All my sins washed away . 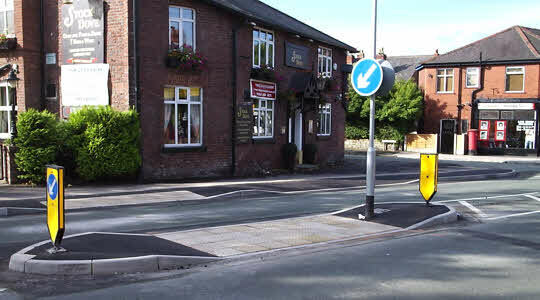 . .
Compstall Road was resurfaced in 2017, wiping out all evidence in the roadway of the island's demolition and reconstruction, and a chunk having been bitten from the pavement. Created for Romiley Arts Federation by HTSP Web Division. © RAF, 2010.